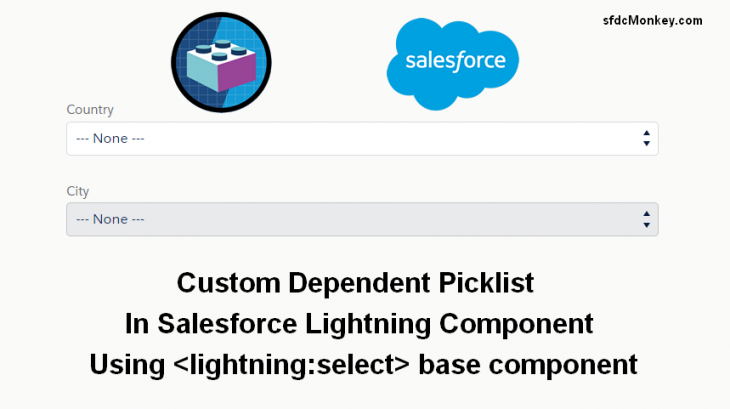 Hey guys, today in this post we are going to create a new updated version of Custom Dependent Picklist fields using ‘lightning:select‘ base component in salesforce. then set field dependency. here country is the controller field and city is the dependent field. you don’t need to change anything in above apex classes. var ControllerField = ; // for store controller picklist value to set on lightning:select. // and fill the all map key on listOfkeys variable. You just need to change the object API Name/Type on line number 15.[DependentPicklist.cmp]. And change dependent field and controller field API Names on line number 16 – 17.[DependentPicklist.cmp]. people also check : How to use SVG in Salesforce Lightning Component ? Thanks a lot for this component. Its really helpful! I need to store the values of the above component details along with another component values by clicking on save button. May I know how this can be achieved please! This is great, thanks! How would you adapt this code to include two dependent picklist fields being controlled by the same controlling picklist field on the same form? still i am not getting the values. What will happen if pick list has translation, always it will display in English.